Lets say you have a brand new switch, and you just want to connect to it quickly via IP (maybe to be able to upgrade the os or something). In this doc we will go over how to create a VLAN, create a SVI, and then bond a switch port to that VLAN. Create the definition of a layer 2 broadcast domain on the switch (a VLAN). The Switched Virtual Interface is the internal interface the switch has that is connected to the vlan. 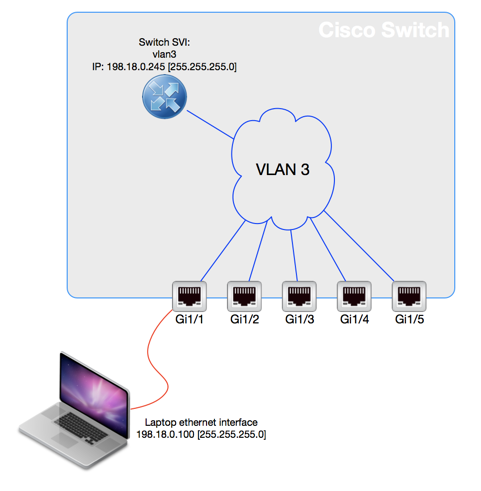 If a switch has a SVI, then you can connect or ping the switch while connected to that VLAN. Without it, you can't directly connect to the switch. The first line interface vlan3 just defines the new vlan. You can enter any free text after the description command. Enter in the IP address of the SVI and the subnet mask after the ip address command. The last three lines are for security. Here, we're just connecting the specified ports to the VLAN. You bind the interface to vlan 3 with the command switchport access vlan 3. The switch knows that this is just a standard switchport with no vlan tagging by the command switchport mode access, and the port comes online right away, rather then the 30 second spanning tree port blocking because fo the command spanning-tree portfast. If you want to add more ports to the vlan, just repeat this for interface GigabitEthernet1/2, interface GigabitEthernet1/3, etc. When the prompt is still router (config)# you can do the following to finish the changes you just made. Set your laptop up to an ip on the right vlan. In this example, the laptop's IP would be 198.18.0.100 [255.255.255.0]. You don't need to add any IP in the default gateway, since we're not doing any routing yet on this interface. Once that's setup, make sure you can ping the SVI.